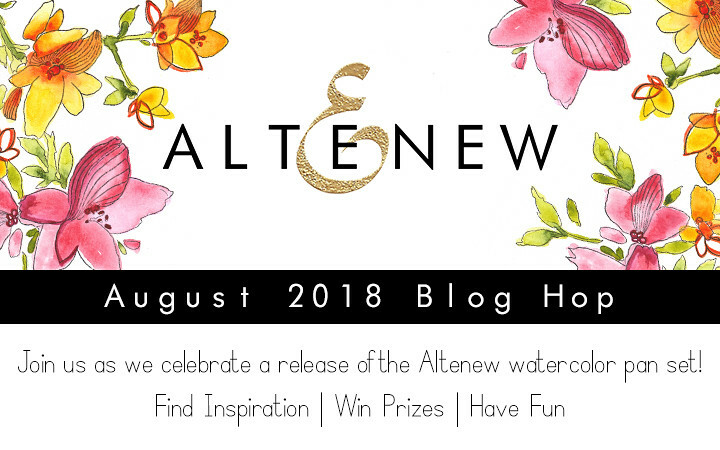 Welcome to the Altenew Watercolor Release Blog Hop! I am super excited to be joining Altenew to showcase their brand new 36 color Watercolor set! This beautiful set of 36 vibrant watercolor half-pans coordinates perfectly with our line of ink. They are intensely pigmented, fade minimally when drying, and some colors have lovely granulating effects. They are stored in a convenient plastic case, designed with space for your brush (included) and a palette in the lid for mixing. Some of the case lids snap off upon opening and can easily snap back on after you are finished creating so you can store your mixed paints with the rest of the pan colors. I was extremely excited to try out this new set of watercolors and I was extremely pleased with the results! One of the things I find discouraging with working with watercolors is that the colors are not as vibrant once they dry. Well, these are! They are just as vibrant and gorgeous after they dry as they are wet! I'm thrilled with them, and will be pulling them out for most of my watercoloring projects I'm sure! 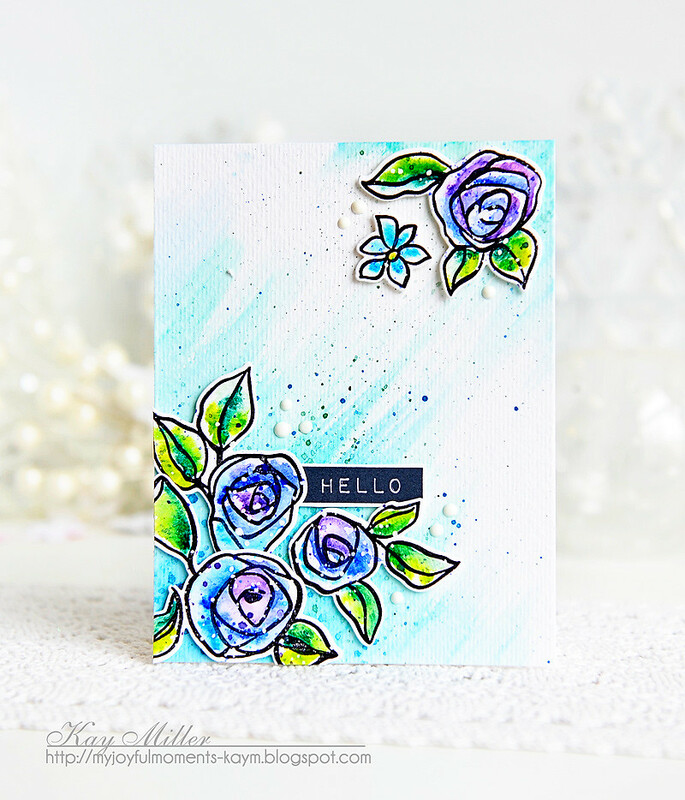 For my first card, I used the Geometric Flowers stamp set and the Label Love Stamp set. I heat embossed the designs on watercolor paper with white embossing powder, then wet my paper and just laid color down in the different sections with my brush. After this dried, I sprinkled more of the same colors or watercolor around by tapping my brush onto my paper. For the flower on top, I colored it with Copic markers, cut it out with the coordinating die and adhered it with foam tape. The sentiment is from the Label Love stamp set. I stamped it with black ink, cut it out and adhered it over the flower with foam tape. 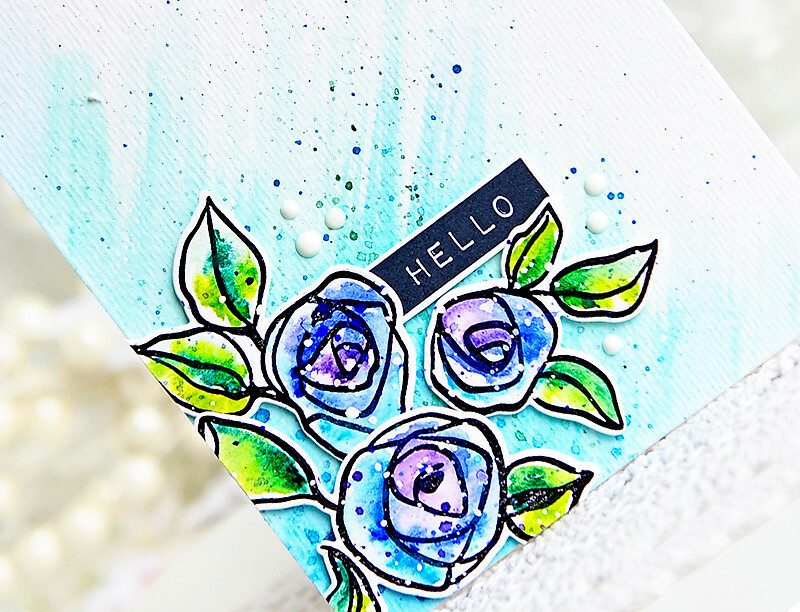 My next card uses the Bamboo Rose stamp set along with the Label Love stamp set. I stamped all of the flowers onto watercolor paper with waterproof black ink. I then loosely watercolored them in with blues and purples. After they were dry, I splattered them with more of the same colors of watercolor and some white ink. For the background of my card, I just used a large brush and with large strokes pulled watercolor onto my paper from the bottom corner. It's a really quick way to make a fun background. I also speckled it a little with more of the same color watercolor. The flowers were die cut out with the coordinating dies and adhered with foam tape. I added a few drops of Nuvo Crystal Drops in white. For my last card, I used the Peony Scrolls stamp set and again the Label Love stamp set. For the background, I wet my watercolor paper, and loosely laid down dabs of blue and yellow watercolor. When this was dry, I speckled with more of the same blue watercolor. The flowers I stamped on watercolor paper with waterproof black ink, then loosely watercolored them with the pinks, orange and yellow watercolors. The leaves were done the same way using the greens and blues. After they were dry, I speckled them with more of the same colors used to paint them and some white ink as well. The flowers were then cut out with the coordinating dies, and along with the sentiment, were adhered with foam tape. To celebrate this release, Altenew is giving away a $50 gift certificate to SIX lucky winners! Please leave a comment on the Altenew Card Blog and Altenew Scrapbook Blog by 8/15/2018 for a chance to win. Six winners will be announced on the Altenew blogs on 8/19/2018. 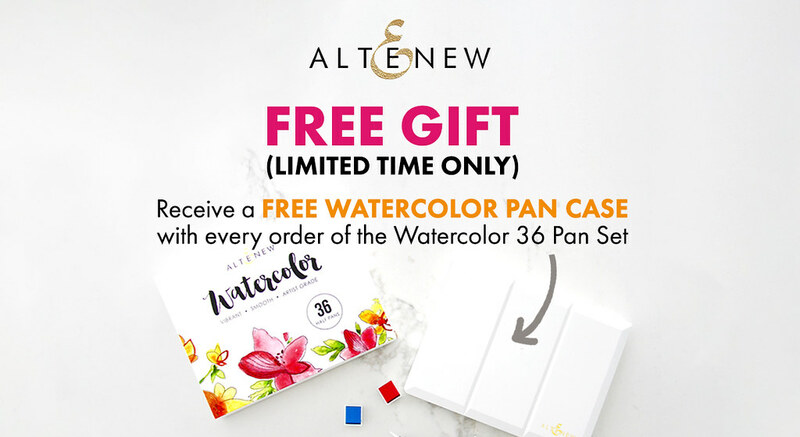 Also Altenew is giving away a free watercolor pan case with every order of the Watercolor 36 pan set! Thanks so much for stopping by! Below is a complete list of all of the blog participants! Next in line is Zinia Redo! You do Florals so well, love your cards! I love all of your background and then added your floral pieces...love all of them.. So very pretty! I love the bright colors!! Thanks for the trio of card samples. The splatters add sooooo much. Goodness, Kay, these are all so gorgeous! 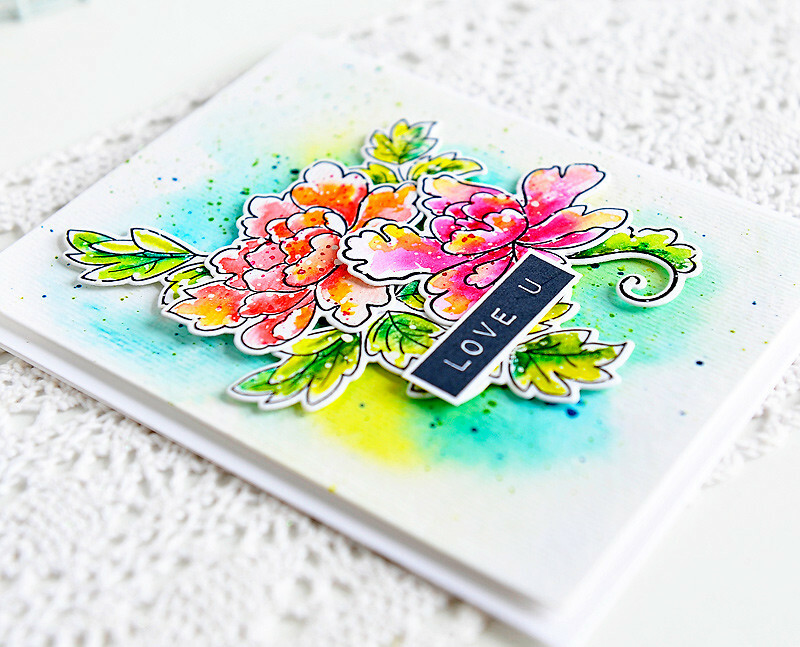 I LOVE your bright colors and the very unique way you create those pretty watercolor wash backgrounds that always tells me that one of these masterpieces is yours! I avery inspired today! Your cards are especially vibrant- I will have to check out these new Altenew watercolors! I love these bright colors! Your cards are stunning! Oh my, such lovely cards! Very bright, cheerful and happy. Would make anybody smile. You really made this set shine!! I love all of these and am very surprised how vibrant the colors are. Nicely done. Gorgeous cards! I love seeing what everyone is doing with this new set. And wagt great colors. Thanks for sharing! Absolutely love this! A watercolour set that is compact, easy to carry around, that co-ordinates with all my Altenew Inks. Love that the pans can be taken out so that individual colours can be replaced that are used more often. And the card inspiration is awesome! Love all of these cheery colors! Beautiful! Very vibrant pretty card samples.....Made me smile...Happy,...Happy,.....Happy.....thank you so much for submitting your great cards. 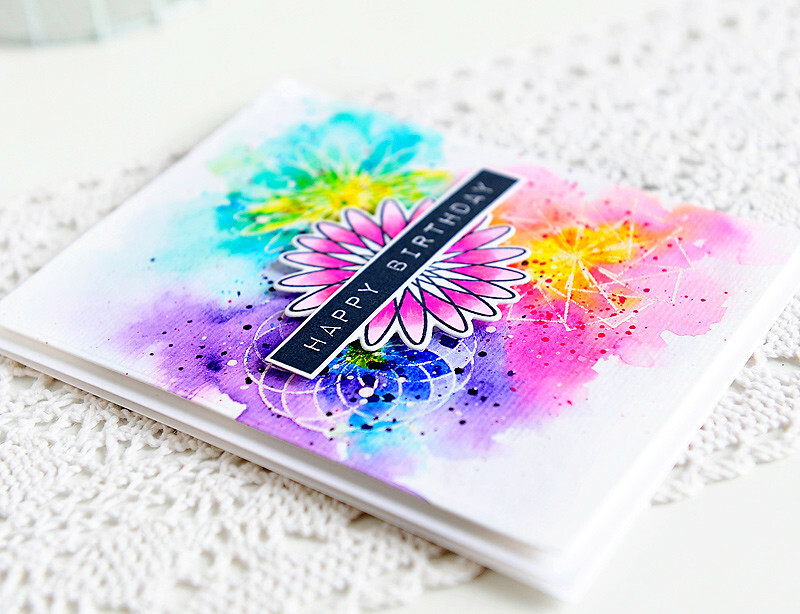 Gorgeous cards and I love these beautiful vibrant colors! So stunning. And now I need this watercolor set ;-)! Beautiful cards! I especially love the brush marks on the second background~ gorgeous! I love the colors, your cards are beautiful and fun! Your cards are beautiful! Love the vibrancy of the colors you used! such gorgeous cards, Kay - love how vivid and bright they are! So much pretty here Kay! Gorgeous watercoloring and inspiration! Gorgeous cards, Kay. Love all! All of your cards are very pretty. I love the vibrant colors. You are the perfect one to try these out!! Your cards are STUNNING!! Watercolor and me do not get along, though I try!! 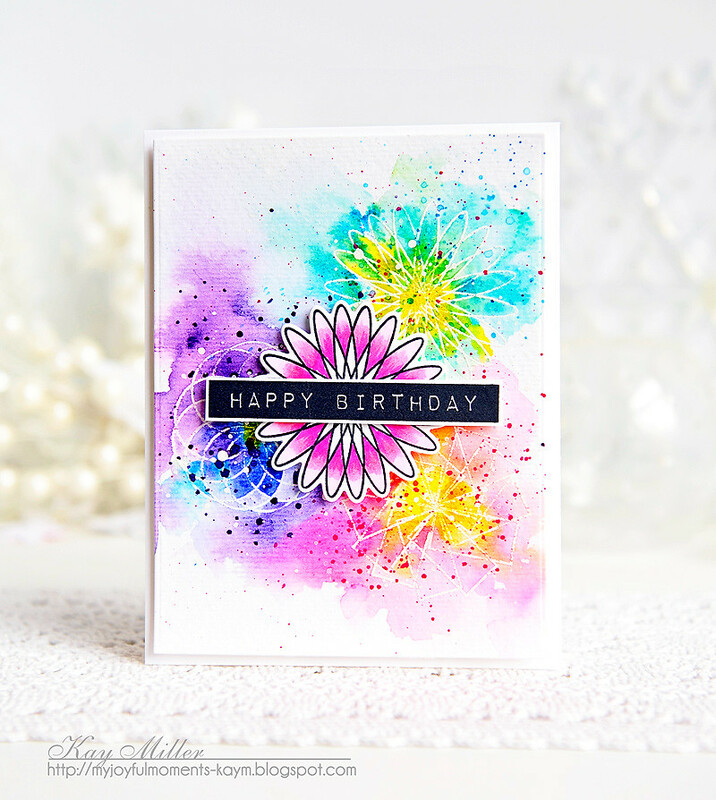 I love the "splatter" look on all your cards and the colors are just SO VIVID! Great job! Beautiful cards! I love the colors in this set. What beautiful cards. The colors are so vibrant. Will have to try this next time. Beautiful cards - love the backgrounds too! Thanks for the inspiration! Love your loose watercolor technique, Kay! Looks great with the splatters. this watercolor set is just fabulous! All your cards are so beautiful. I think I am going to like this set of watercolors, too for the vibrancy of the colors. So much prettiness Kay, my goodness the talent you have!! Your card looks lovely. Can’t wait to try these paints. The colors do look vibrant. Thank you. Kay, your artistry inspires me always! the colors are amazing in your hands! 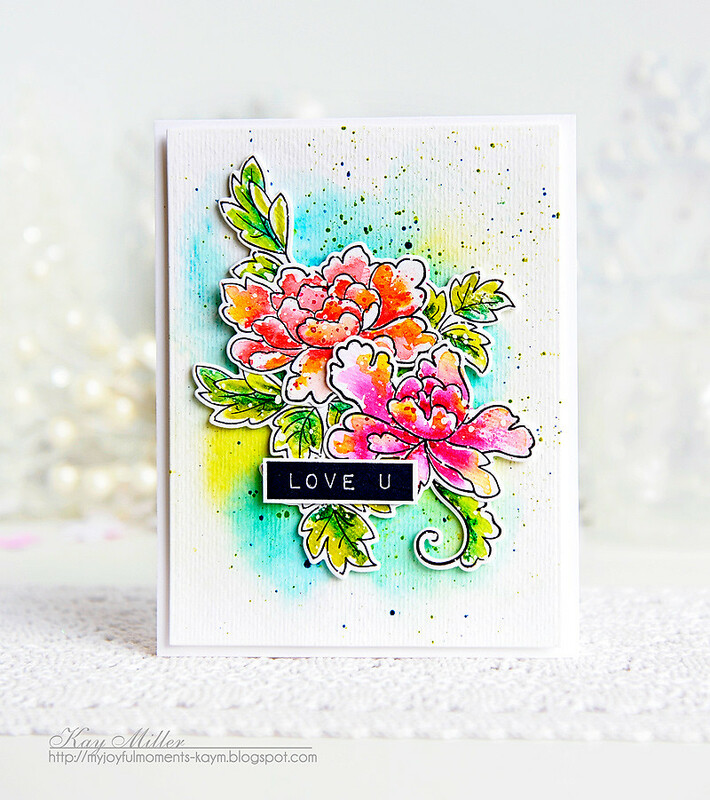 Beautiful cards, love the color combos for these pretty florals. These cards are so whimisical and bright. I love the vibrant colors you used! All 3 cards are pretty but I especially love the Bamboo Rose card! Makes my CAS heart happy!!! I love the vibrancy of these watercolors...so bright and lovely. I love them all so much! I love how each card has a different color scheme! And your water coloring on each one is just sooo fantastic! Love your cards. Espwcially the först one. Can't wait to buythe watercolors. These colors are gorgeous your cards are fabulous Kay! Thanks for Sharing! Gorgeous cards, Kay. Your watercoloring is beautiful! I have long admired your talent with this medium. Your flowers just shine proudly against the backgrounds. Wonderful work! I'm so happy you like the vibrancy. Thanks for sharing! Hugs! Here's the progression as I scrolled down the page: Mmmmmmmmm, Oooooooooooh, Ahhhhhhhh! Literally. (I was actually kind of laughing at myself when I noticed that I did it!) Thank you for some beautiful, joyful color. Thanks for sharing all your awesome projects with us! This watercolour palette looks so yammy! Each card is beautiful and they all show the how lovey water colouring can be with such bright and vibrant different colours. Beautiful cards! Can’t wait to try these out - the colors look so pigmented! 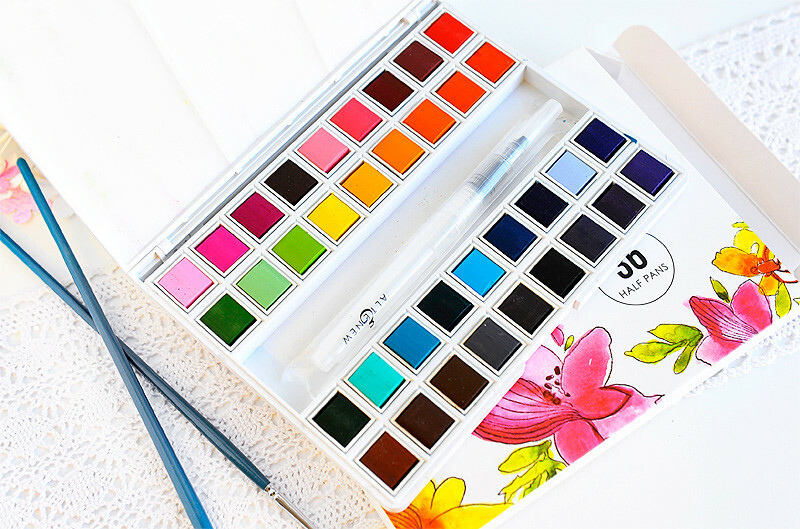 What an awesome coloring pan, it is a must have! I love your sweet projects too!!! 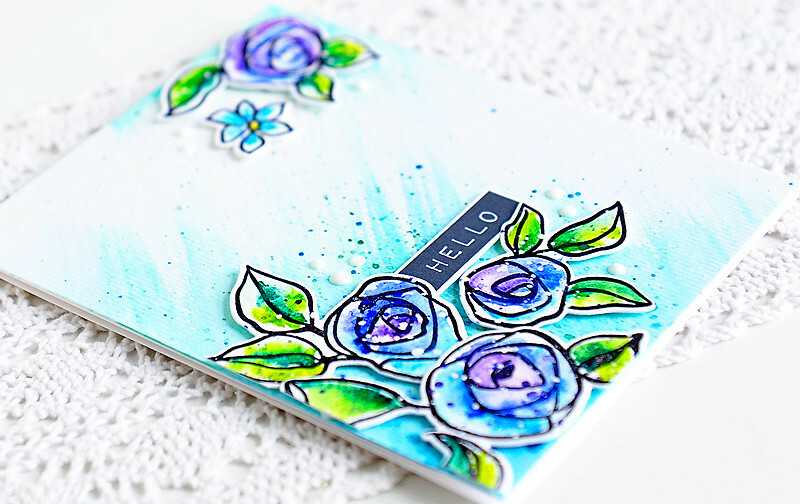 Your cards definitely showcase how vibrant these watercolors stay when dry. They are amazing and your cards are just beautiful! Such beautiful cards. Love the colors. 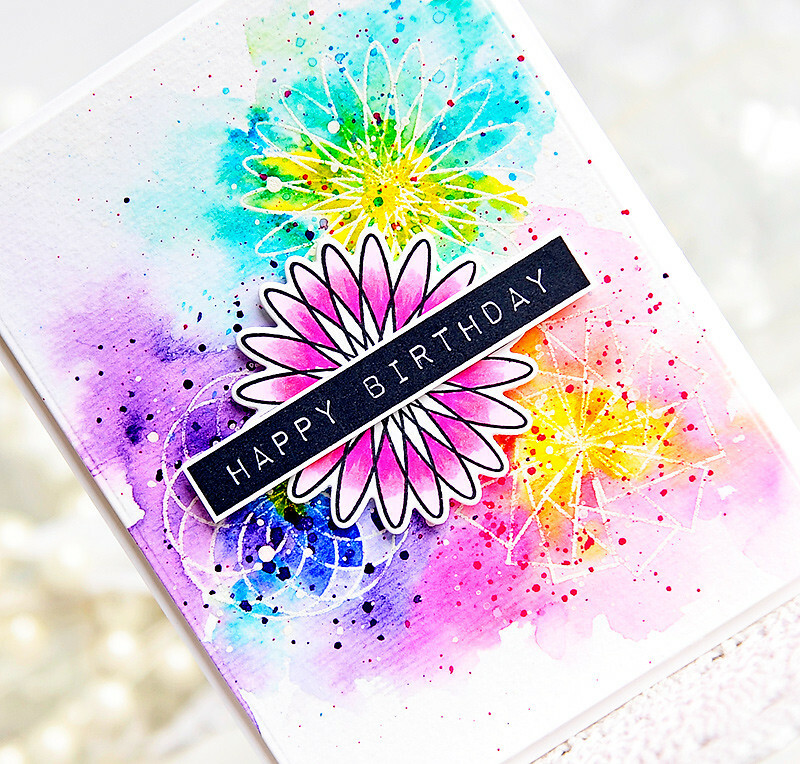 Love all the bright colors on your gorgeous cards! I couldn't wait to see your work with this new set, Kay - and they did not disappoint! Gorgeous designs, as always - my fave is the blue bamboo flowers! The geometric flowers are so vibrant with color. All the cards are fabulous. 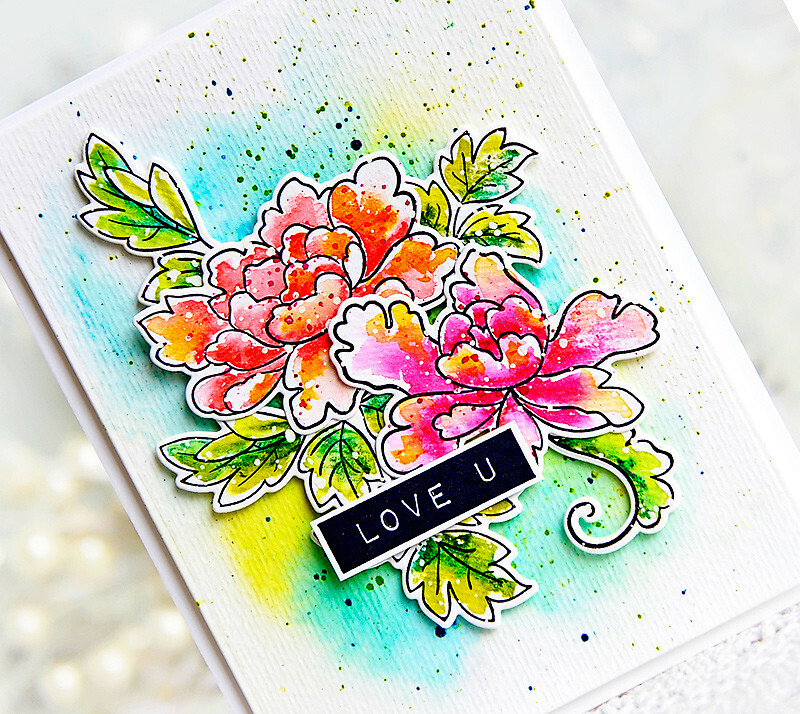 Love your cards and the new watercolor release! Brilliant! Your cards just make me Happy! Gorgeous! I can't wait to try these watercolors. I love your colorful cards. I would treasure a card like this if I received it! Love these cards Kay, the Peony Scrolls card is lovely. I love the watercolour set! The colours are so vibrant yet subtle. The love you card is my favourite and i would love to try and recreate it! Thanks for the inspiration. Gorgeous cards! Beautiful watercoloring - love the addition of the splatters. The new watercolours are gorgeous. And I love the beautiful inspiration! Very vibrant images, you defiantly look like you enjoyed time with these, thanks for all your advice. Awesome release! Beautiful projects! I love your style! Beautiful cards! I love how you pulled the color out of the corners to create the background on the blue card. The bamboo roses are so lovely. What beautiful floral cards. Thank you for sharing your inspiration. You are the splatter queen! Love those! These cards are absolutely stunning! Beautiful work! Beautiful cards with gorgeous colours! Such vibrant colors! Beautifully done cards! More really beautiful cards! I love them all. Especially the card with those deep blue colors, I just love that. The vibrancy of these watercolours are definitely right up your alley. You definitely know how to make them sing. So gorgeous! Your cards are always so amazing, and I love all of these! Beautiful cards. The backgrounds are gorgeous. I love these vibrant colors. luv how what is a 'simple' stroke of a paint brush becomes a lovely background. great work! These are fantastic! I love how vibrant they are! The bold and vibrant colours on your cards are fabulous. These are very pretty cards! So pretty. Love the colors. These are so pretty! Love the backgrounds! These are amazing and vibrant cards! I love the your style - very creative! Thank you for sharing your talent! wow beautiful and stunning cards! Love the vibrant colours. Your cards are fun and vivid. Like your style. Love, love your floral designs. the colors are so bright and gorgeous! TFS! Love all three of your beautiful and colorful cards!! Love your beautiful cards! Can't wait to try these pretty watercolors! All of your cards are such bright, happy and gorgeous cards! I would smile so big if I received these in the mail so I am guessing the recipients will also. Thank you for sharing them with us!